See Lift Safe Direct's wide range of platform trucks, and flatbed trucks. All our flatbed trucks, are manufactured to the highest specifications making our platform trucks, a must for many working environments. We also offer an in house design service. So if you cannot see a flatbed truck, which meets your requirements, please contact us direct and our design staff will be able to help you to design a platform truck that meets your requirements. Useful junior low load trucks with fixed or folding frame. With strong weld tubular construction. 2 swivel castors and 2 fixed castors. 125mm dia red centre wheels, roller bearings and rubber tyres. Finished in Blue epoxy. Large standard euro platform with fixed or folding frame. With strong weld tubular construction. 2 swivel castors and 2 fixed castors. 160mm dia red centre wheels, roller bearings and rubber tyres. Finished in Blue epoxy. Designed for all-around load retention with a simple yet robust construction. Finished in blue epoxy. Wheels: 2 fixed 2 swivel castors. 160mm dia red centred wheels with roller bearings and rubber tyres. Tough and manoeuvrable 500kg single or double ended warehouse platform truck. Fitted with sliding self-centring wheels. Centre balance wheels are housed in fixed castors. All wheels are 200mm dia with rubber tyres. 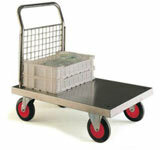 500kg platform truck with substantial timber deck, all steel welded frame. 2 swivel and 2 fixed castors with 160mm dia rubber tyred wheels and roller bearings. 250 series platform truck with a timber deck with optional removable timber/mesh panels. Built with diamond balance wheels and a load capacity of 250kg. 500 series platform truck with a timber deck with an option of all steel welded frame, mesh panels or timber panels. 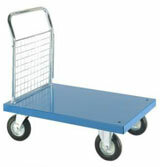 Built with 2 swivel and 2 fixed castors with rubber tyred roller bearing wheels and a load capacity of 500kg. 500kg capacity stainless steel platform trucks, which are available with 3 platform sizes (1000 x 600mm, 1000 x 700mm & 1200 x 800mm). These high specification platform trucks are suitable for the food and drink industry, completely formed from 304 grade stainless steel sheet, tube and wire mesh. High quality powder coated decks in a range of attractive colours, with bright zinc plated fixed mesh ends and removable sides. 2 swivel and 2 fixed castors with 200mm diameter rubber tyred wheels with bright zinc plated centres and roller bearings.